How do you say “Chinese” in Chinese? Well, it depends. huh? Let’s start with a survey. 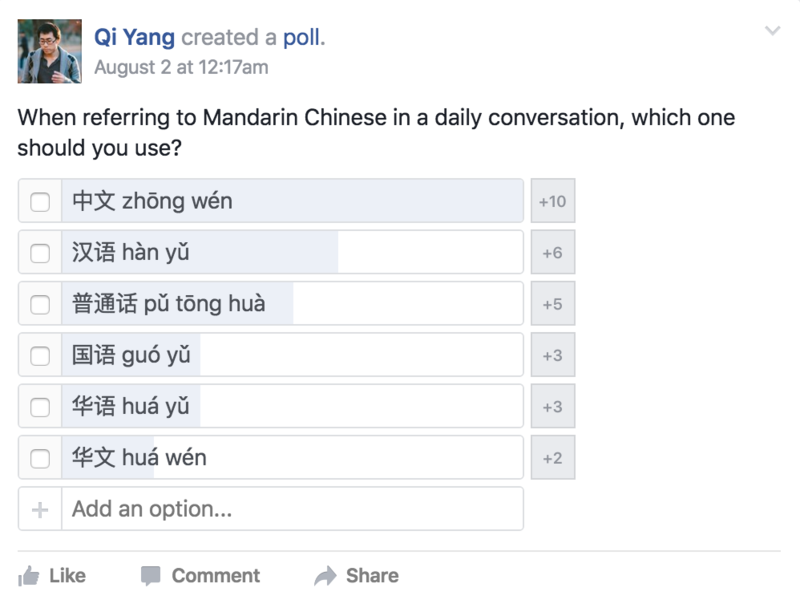 Below is a poll I posted on Facebook together with the corresponding responses I received from Chinese learners. Note that this is one of many polls I posted. Confused? What’s the difference between these? Let’s go through them all one by one. Literally means Chinese text. Although this word literally means Chinese text, it is used to refer to both spoken and written Chinese. This should be the word you use whenever you are referring to Chinese. Literally means common language. Mandarin Chinese is the official language of China, it is the common language, hence the name Putonghua. Putonghua is the formal way of referring to Mandarin Chinese as opposed to other Chinese dialects. So if you want to explicitly say Mandarin Chinese you would say Putonghua. Literally means the language of Han. There are 56 ethnic groups in China. Han is currently the dominant group in China (over 90% of the Chinese population) and Mandarin Chinese is the language of the Han ethnic group. Hanyu explicitly refers to Mandarin Chinese but since Mandarin is the official language of China, Zhongwen and Putonghua have become the words people use to refer to Mandarin Chinese and Hanyu has become outdated. Literally means national language. People from Taiwan and Hong Kong refer to Mandarin Chinese as Guoyu. Literally means Chinese text. People from Malaysia and Singapore refer to written Chinese as Huawen. Literally means the Chinese language. People from Malaysia and Singapore refer to spoken Mandarin Chinese as Huayu. Literally means the Chinese language. This is very similar to Zhongwen and both can be used interchangeably. The only subtle difference would be that Zhongguohua exclusively refers to spoken Chinese. 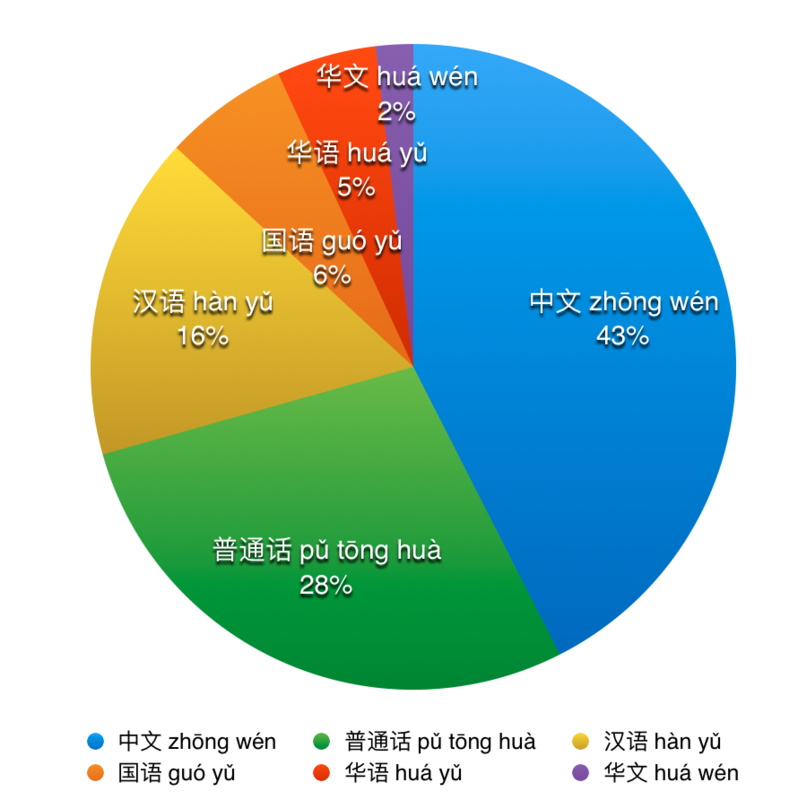 Another thing to note is that people always prefer to use shorter words and since Zhongwen is one character less than Zhongguohua, Zhongwen is the preferred word to use. Just use Zhongwen whenever you are referring to Chinese or Mandarin Chinese. If you want to say Mandarin Chinese explicitly, then use the word Putonghua. That’s it. These two words are all you need.